Flip Out Mama: Galstanberry Girlz Giveaway! 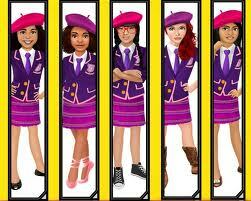 You guys know I am a big fan of the new Galstanberry Girlz book series! I think these would make a great gift for the girls on your Christmas list! To learn more about Galstanberry Girlz books, check out my exclusive author interview here. This month, Galstanberry Girlz is giving away an autographed copy of the first Girlz of Galstanberry book, along with a Tabitha Crawford collectible bookmark!! Come back here and leave FIVE comments telling me where you posted. You may do this entry every day, making you eligible for five extra entries per day! Contest will end on 12/11/2010 at approx 10pm. Winner will be chosen via random.org and will have 48 hours to respond or an alternate winner will be chosen. I am not responsible for prizes that are lost, damaged or otherwise not received. My daughter would relate to Lillian the most. I Follow Flip Out Mama on Facebook. I think Tabitha Crawford would be most like my daughter. My daughter is most like Nisha. I think we'll go with Brandi. I follow/like Flip Out Mama over on Facebook too. My daughter would relate to Nisha the most. Tabitha Crawford is the most like my daughter! My granddaughter is definitely sassy like Tabitha Crawford. My daughter is like Nisha Mohan: very clever. According to the quiz my Lilith would most closely identify with Lillian, funnily enough! I like GG on FB(tina wofford page). I entered your Creativity for Kids giveaway. My daughter is most like Tabitha Crawford, definately gets a 10 for being sassy! I follow Galstanberry Girlz on facebook.